I always take the backroads home. The narrow two lane roads offer me a more tranquil way to get home. 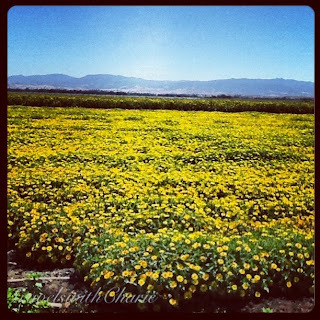 There are also rewards to reap in these backroads like this view of a sea of yellow chrysanthemums and sunflowers with the Gavilan mountains in the distance. Right next to this beauty is a cabbage patch. I was completely surprised to see how large the cabbages were. The almond tree above is in the backroads of Fresno County where the centenary heat in the summer scorches your skin even though you're under the shade. But for a few minutes I went outside to view these nuts up close. I learned that almonds are harvested in September using a machine which shakes the tree. A net of some sort is wrapped at the base of the tree to catch the falling almonds. These are then washed and processed so you and I can enjoy them later at the store shelves.